Hi after I returned from Bali and green smoothie making with the locals I had a few days before I had to move out of home then I went to Sydney to pick up my new VW van that has now become my temporary home on wheels! 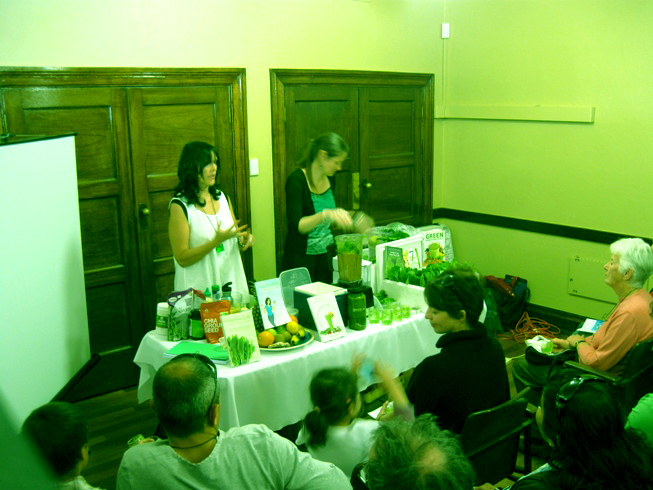 I came back to Canberra for my first official dailygreenbar green smoothie workshop. I was asked to do this by the organisers of Canberra’s first Living Green Festival at the Albert Hall on October 16th. I ran this together with my friend Maryanne McKay who did a great job getting the greens and fruit together and blending. We had a varied selection of greens from Choku Bai Jo farmer’s market outlet who were one of the sponsors of the festival. Shake those greens! So what’s more nutritious? The beets or the greens? The greens of course!!! 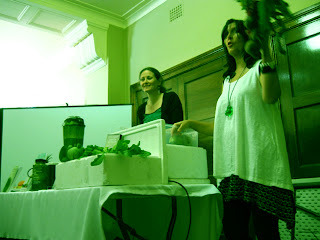 We had around 25 people from all age groups in our audience in a very noisy room near the kitchen and for an hour we shared the green love and talked (very loudly!) about greens, green smoothies, the benefits, blenders, superfoods and resources. 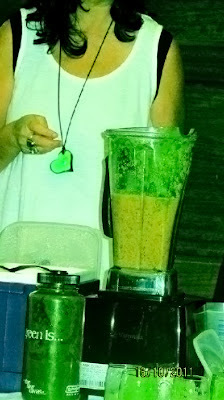 We made about 3 blenderfuls and everyone loved them and wanted to know where they could buy the books. We’d obviously inspired our audience enough for them to want more information! 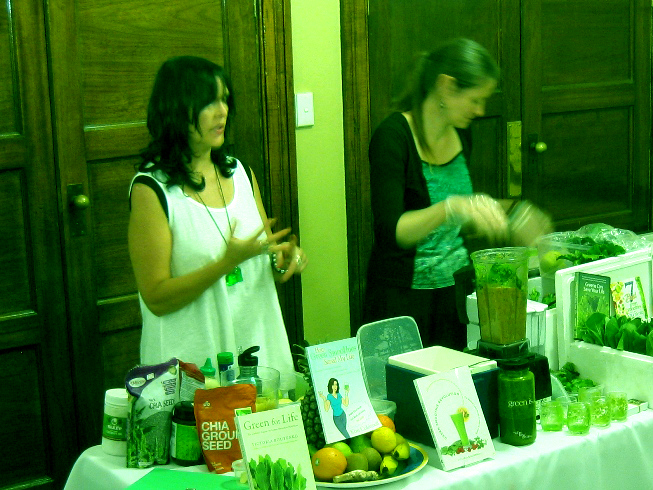 The resources on display were Victoria Boutenko’s Green For Life and Green Smoothie Revolution. Robyn Openshaw’s Green Smoothie Diet and How Green Smoothies Saved My Life. The dvds were from the Boutenkos- Greens Can Save Your Life, The 7 Best Green Smoothies from Raw Family and Sergei Boutenko’s The Miracle of Greens-how greens and wild edibles can save your life. 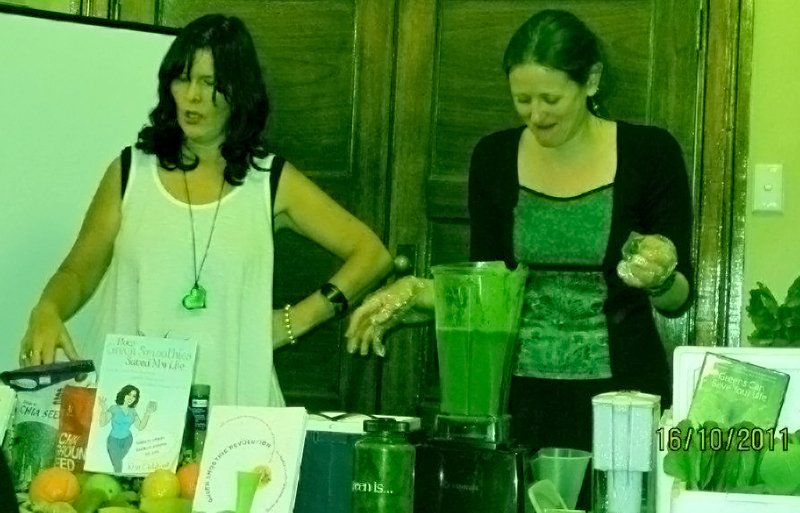 I am going to sell Green For Life that includes my 4 page testimonial in the latest edition and the Green Smoothie Revolution at future workshops so I also have copies to buy from here. I had also printed over 300 online testimonials and had these in a big book for anyone to read…evidence from people reversing lifelong health problems and illness ranging from arthritis to fibromyalgia. My Dailygreenbar Guide To Green Smoothies has been printed and is available for sale from here too. 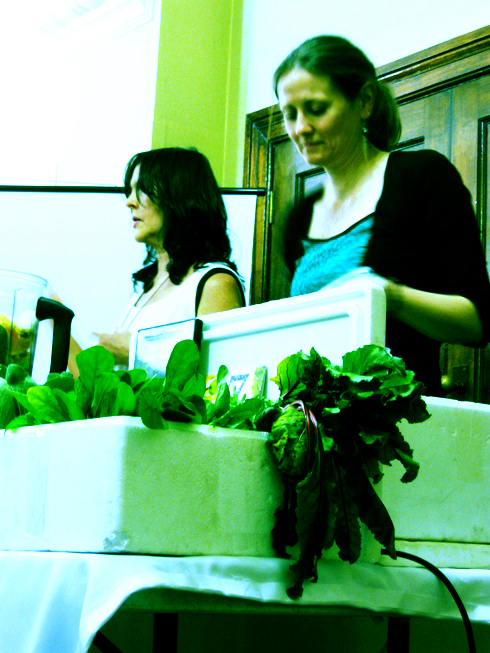 This covers all aspects of the workshop and green smoothies, making, blending, nutrition, resources, kids and ingredients. It is 20 pages colour and for sale for only $15. Send me an email to dailygreenbar@gmail.com for copies. This is a great introduction to the what why and how of greens and green smoothie making plus recipes. 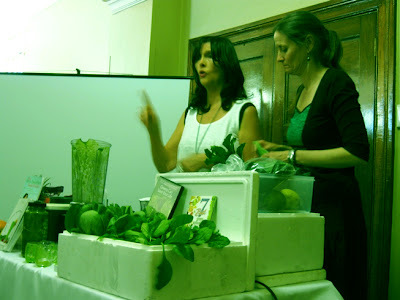 Section headings- green smoothies/ why drink your greens/ why green smoothies/ greens/ fruit/ extras/ tips/ making a green smoothie/ kids and green smoothies/ recipes/ testimonials. This is also ideal to give anyone (especially cynics!) as a quick, easy and accessible guide/introduction to green smoothies. So sharing the green love continues! I am really looking forward to getting organised and doing more of these workshops. The different venue and audience potential is limitless-yes festivals but also schools, hospitals, workplaces and I’m thinking even retirement homes! Hi! 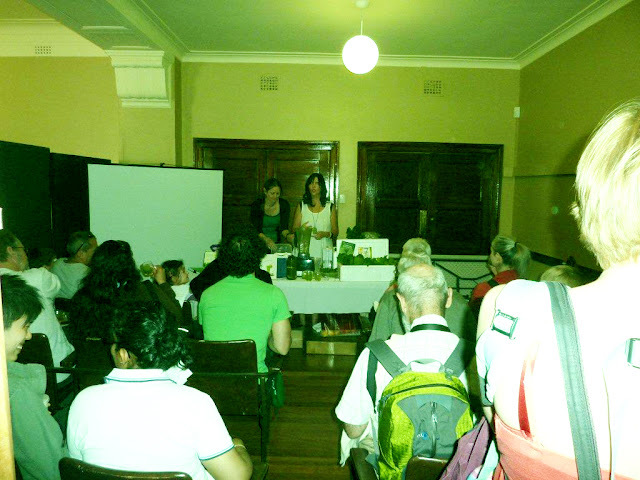 I bought your “Dailygreenbar Guide To Green Smoothies” at the Canberra Harvest Festival. I made my first green smoothie today (with what I had on hand – Kale, cos, banana, orange, rasberry), and have taken the plunge and ordered a vita-mix. Yay!